Hey Everyone! 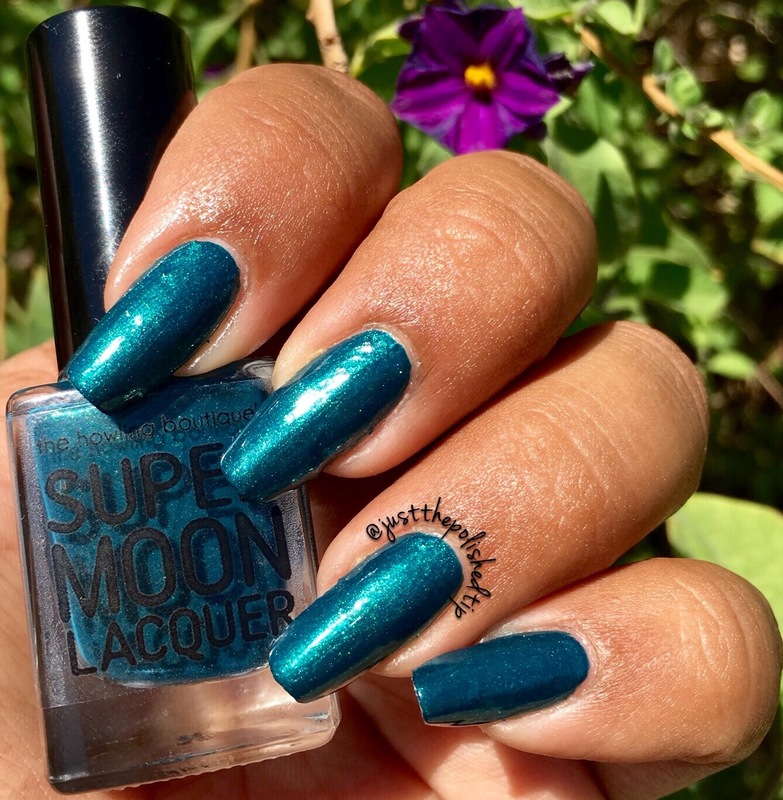 I am back and today I have two gorgeous colors from Super Moon Lacquer’s Ready to Launch collection. Let me tell you that it is rare when I buy a full collection and happen to loooove all of the colors. This entire collection was just beyond gorgeous. Mardi, the creator behind these lovely polishes, has really created something out of this world. 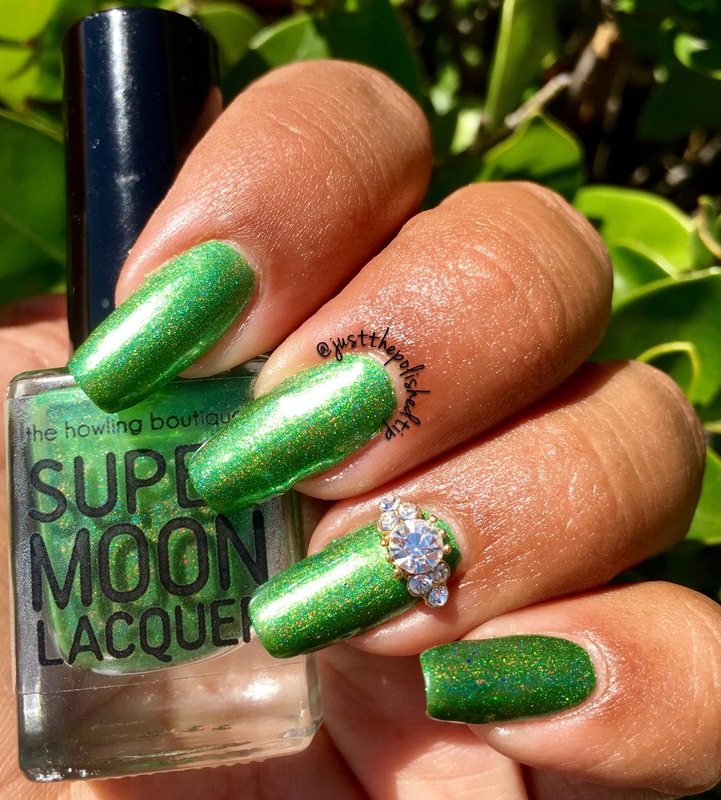 She started making polish for her jewelry business, The Howling Boutique, and she had so many requests for the polishes that she started a new adventure. In an industry where creativity is key she Nailed this collection 😉 Well enough talking here is the first two colors that I have swatched for y’all. In all of the photos I did three super thin coats and top coat. I paint very thin so if you have a heavier hand you could probably get away with two. I had zero issues with formula. It applied like a dream with very little clean up necessary. I used matte topcoat on the thumb so you can see that there is some teeny bit of blue in here that really makes this polish pop. Look closely cus my camera didn’t want to quite pick it up. 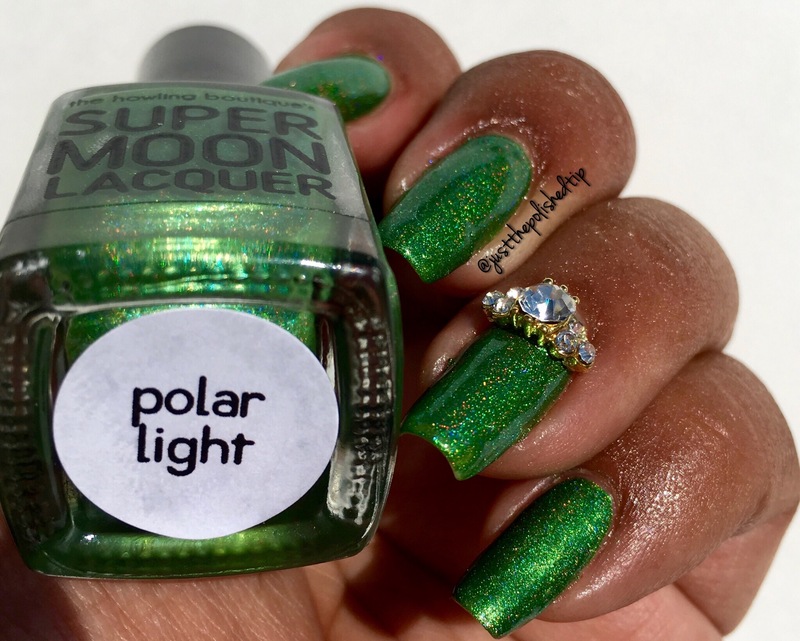 Let me tell ya I am not usually a fan of green, but this green has already been used in 2 of my manis!! Next we have Tidal Disruption. 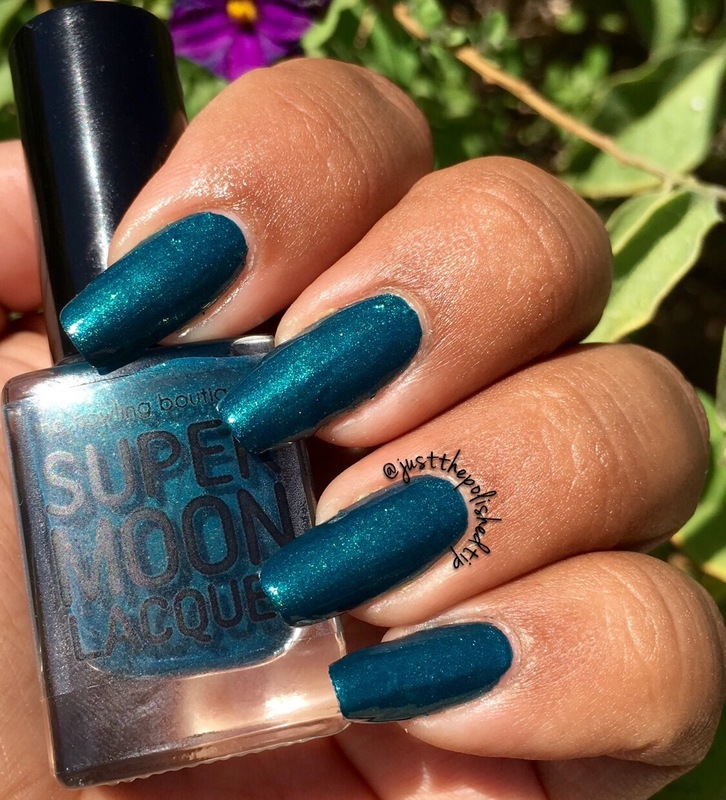 This polish is a dark teal with some gorgeous shimmers. 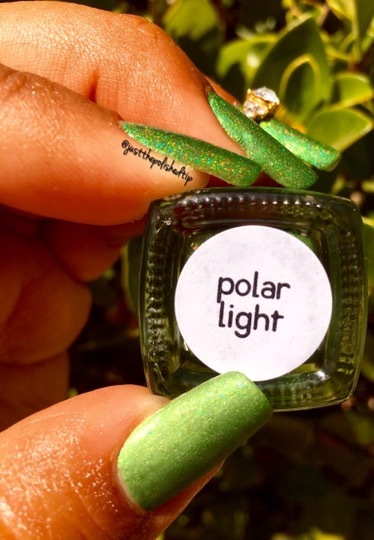 The maker describes it as “a dark teal green with gold to green color shifting shimmer and gold, turquoise, and green sparkle.” It looks great in the bottle and freaking amazing on your actual nails. This one really comes to life when you put it on and that resulted in my camera not wanting to capture all of the greatness. This was also three thin coats and top coat. I think this one also would have been a 2 coater if I didn’t have the need to paint 3 coats. Formula was a tad thicker than Polar Light, but still very easy to work with. 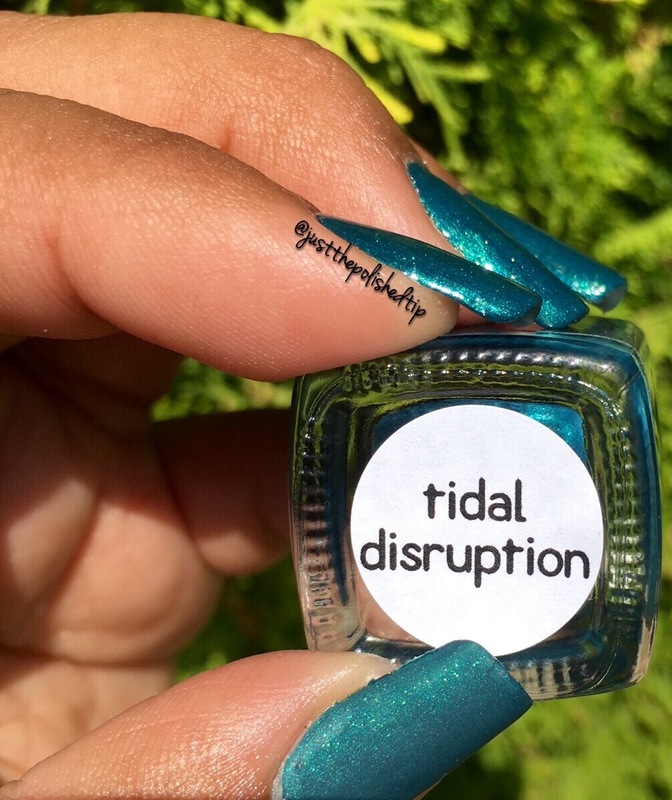 I’m sure the thickness has to do with pigments and science and stuff ;p.
I think this was one of the ones I was most looking forward to despite having so many teals in my collection and I am so glad I got this, because it is so very different from any other teal I own. The Ready to Launch Collection is still available and you get free shipping on the entire collection!!! Who can pass that up? 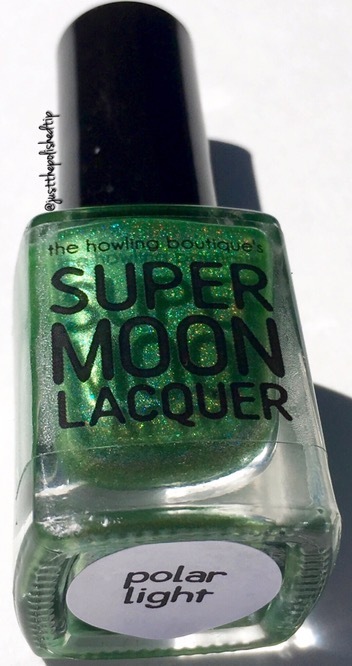 Here are some links to the store and social media for the Howling Boutique/Super Moon Lacquer. 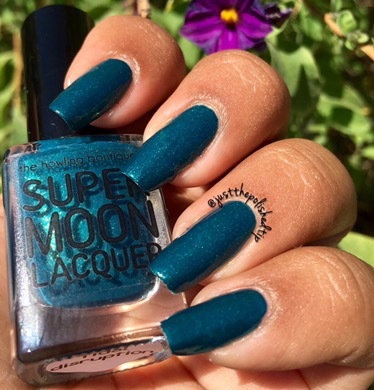 Keep an eye out for future posts using Super Moon Lacquer, because I see this brand being a fave. I am a 28 year old polish lover, gamer, LEGO builder, and animal lover. I have an amazing man in my life and an amazing dog named Bullit. I currently reside in the Silicon Valley. They are both so gorgeous and I love your swatches. Thank you so much 🙂 I loved this whole collection. Can’t wait to post the other swatches.